Beneath the Rowan Tree: Use Your Head! 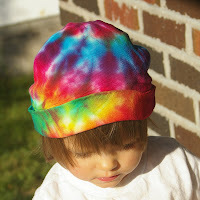 I just listed some new stuff ~ bandanas and toddler hats (100% cotton)~ They are fun to dye and fun to wear, I may end up keeping this hat (pictured) for Rowan. The scarves work great for Andy's big noggin and Rowan's wee one, and the dog, too! I managed to sort all my blanks tonight, finish my 'Ugly Fishies' dress to list tomorrow, finish up a family set of 5 items (dyed and painted) and I hope to do up another batch of dye tomorrow night as this last bunch were all for customs and I didn't get to make any new clothes for fun. Market in the morning, too. If there is no traffic this week, I think I'll skip a few, it is too much time wasted (even though I get uninterrupted painting time!). I made sale #30 today. yay! Your new hats are terrific! Congrats on sale #30 too! 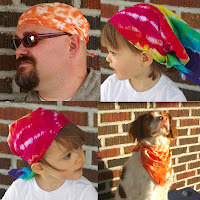 Great bandanas, love the colors ! Andy looks a little like my husband, weird :)---oops, that didn't come out right, I meant it's weird he looks like my dh, oooh never mind, you know what I mean lol ! What a gorgeous family! Looks like you are having a great time, and such bright colours! Yay for sales! That's great. Love your pics! Oh, bandanas. Now that is cool!